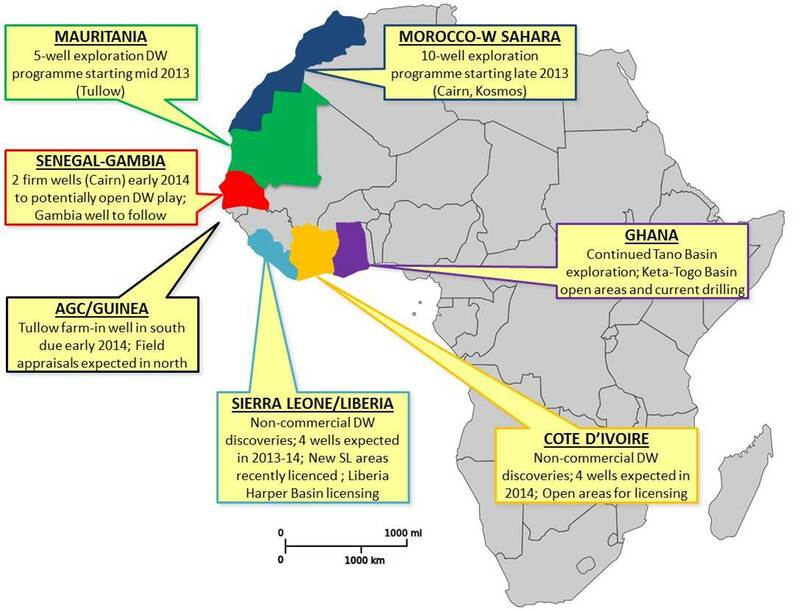 2013–14 Exploration Drilling: Morocco to Ghana. Apart from some minor hydrocarbon production in Côte d’Ivoire and the well documented deepwater production in Ghana, there is currently only production in the shallow water offshore Mauritania and onshore Senegal. This production, limited though it is, coupled with recent drilling successes, provides abundant evidence of working petroleum systems that can be extended into frontier areas offshore (Courtesy Dolphin Geophysical) Despite the fact that many of the established petroliferous basins of Africa are entering the mature stage of exploitation, it is true to say that the potential for African sedimentary basins to continue to attract the interest of international oil and gas companies continues unabated. The well attended, and increasingly unmissable, annual PESGB/HGS Africa conference, hosted this year in London, is testament to that. Almost in spite of continued exploration successes in a number of established and emerging plays, common consensus says that the hunt for new resources will get harder. With this in mind explorationists continue to look to all corners of this massive continent with an increasingly forensic approach. Advances, driven by leaps in technological capability, continue to increase the fidelity of the data and reveal with clarity the subsurface, improving our understanding of the evolution of the prolific marginal and interior basins of Africa, seemingly almost exponentially, in recent years. However, that knowledge and understanding continues to be patchy, and has led many analysts, like Adrian Robinson, consultant to Dolphin Geophysical, to conclude that, while the industry continues to look further and further from established markets and infrastructure, some areas of Africa should probably be better explored, yet remain underexplored and still offer massive potential to deliver world-class hydrocarbon resources. One such underexplored province is the North West African Atlantic Margin, where industry interest has always been high but activity has, to some extent, waxed and waned over recent years, or as Ian T. Edwards, VP Global MC Surveys and New Ventures, Dolphin Geophysical, stated recently during promotional roadshows, ‘…it is a region neglected by the industry for over 20 years’. Fresh discoveries and newly acquired datasets, like the recent seismic survey by Dolphin and TGS, are leading to renewed interest and an increased level of activity in the region. Over the next 12–18 months we can expect to see in excess of 20 new exploration wells to complement the increasingly dense patchwork of seismic and other remote sensing datasets in the region. The Mauritania-Senegal-Gambia-Bissau-Conakry (MSGBC) Basin continues to be a key area of exploration. With its history since the Triassic, the basin provides multiple candidate source rocks, many already tested. The onset of sea floor spreading in the Middle Jurassic, with the development of associated salt basins and carbonate platforms, provides the potential for the deposition of ample reservoirs and the creation of multiple traps, similar to those seen in analogous hydrocarbon basins the world over. Major Cretaceous and Tertiary clastic input to the basin provided further targets for frontier exploration. With over 40 companies now participating in the hunt for oil, the region is entering a new level of activity. Whilst many of the blocks are now taken there are still plenty of opportunities for entry to the basins, as evidenced by several active farm-outs and acreage deals completed in recent times. Most countries in the region are offering an ‘open door’ policy to investors and there is a bidding round planned for Mauritania in the next 12 months. In addition to this many of the blocks are sizeable with significant relinquishment areas that will no doubt attract some interest when they become available. Evolving legal and fiscal regimes reflect the increasing maturation of the region in terms of political and social development, with many of the countries in the region now undertaking democratic elections and putting in place production sharing programmes analogous to other emerging areas in the region. With so much activity on the horizon, now would not be a good time to take your eye off this underexplored but evolving area. It was a successful 2018 in Middle East oil and gas exploration for the small Gulf states and UAE.